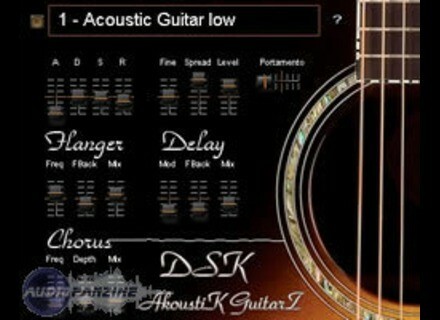 AkoustiK GuitarZ [Freeware], Virtual acoustic guitar from DSK Music. DSK Music has released yet another free VST instrument for Windows. 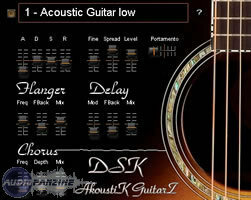 DSK AkoustiK GuitarZDSK AkoustiK GuitarZ is a sampled-based acoustic guitar sound module. * 3 Fx (flanger, delay and chorus). DiscoDSP Discovery DiscoDSP has updated Discovery Mac to Release 2. Opulent Audio DirtyGirl Opulent Audio has announced the release of DirtyGirl a new synth VSTi for Windows that is bundled for free with purchase of a license for Opulent Audio's bLO-FIsh VSTi ($8).